So, yeah, know how I was saying life got really crazy? And also I came to the realization that my blog had pretty much become a billboard? Well, in all of that chaos, I guess I sort of forgot to announce my own release. Heh. So guess what? 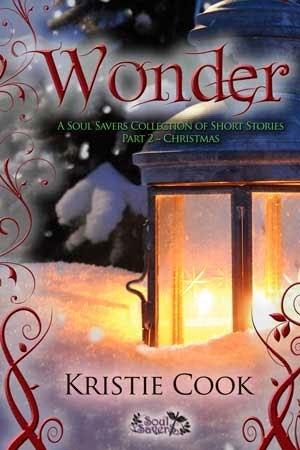 Wonder: A Soul Savers Collection of Short Stories Part 2 – Christmas released! It’s been out for a couple of weeks already, actually. How lame am I? Anyway, here are the details! This second part of the Wonder collection of short stories brings three New Adult Paranormal tales to read by the fire with the Christmas tree lights twinkling. What do you get the woman who needs nothing while staying within her “rules”? Tristan strives to find the perfect present for Alexis, although all she wants is him. Will he unearth just the right gift in time, or is his presence really enough? In response to fans’ high demand, this story comes from the man himself, winner of several book-boyfriend and best-hero contests. Told from Tristan’s point-of-view, Presence contains plenty of steam to keep you warm through the chilly holiday season. Once among the elite of the evil Daemoni, a vampire converted to the good side experiences her first Christmas. She struggles to understand the traditions and expectations of the season and believes she’ll never get it. At least, until she meets someone who needs her help—and will never be able to repay her. Can this newly changed vampire find the true miracle of Christmas in her heart and soul? Or will she stay in the comfort zone of her wicked ways? Daemoni warlock Claire always does what everyone else wants her to do, and she can’t help but wonder if this makes her bad at being bad. Wanting to do something for herself for once, she bails on the Random Acts of Evil festivities for anti-Christmas and disappears. When sparks fly between her and a were-bear she runs into, she sees her chance to defy the most controlling people in her life: her family. But…will she have the courage to do it or will she bow down to them once again? Meet new characters and revisit your favorites from the world of the bestselling Soul Savers Series by Kristie Cook. This is the second of a three-part collection, with Thanksgiving already released and New Year’s coming early December 2013.